Live Nation is pleased to present PATTI LaBELLE at the NYCB Theatre at Westbury on Saturday, November 29 at 8 p.m. Tickets are $89.50, $69.50 and $49.50 and are available online at www.ticketmaster.com, charge by phone at 800-745-3000 or at the Westbury box office. For further information, visit www.TheTheatreAtWestbury.com. Event, date and time are subject to change. 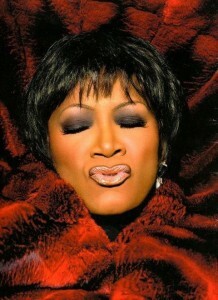 Beautiful simply does not describe the incomparable force known to the world as Patti LaBelle. As time continues to evolve, the soulful singer’s name has become synonymous with grace, style, elegance and class. Belting out classic rhythm and blues renditions, pop standards and spiritual songs have created the unique platform of versatility that the Grammy-winning LaBelle is known and revered for. The celebrated singer of such hits as “Lady Marmalade”, “New Attitude,” “If You Asked Me To,” and “On My Own” (with Michael McDonald) has enjoyed a fruitful 53-year career in show business, releasing over 50 albums. LaBelle has won seven NAACP Image Awards, two American Music Awards, received three Emmy nominations, a Soul Train Lifetime Achievement Award and has a star on the Hollywood Walk of Fame. In 2006, The Essential Patti LaBelle was released and in 2007, she released Miss Patti’s Christmas. In 2009, she reunited with Sarah Dash and Nona Hendryx for the first time in 30 years for the critically acclaimed Labelle reunion album, Back to Now. Patti LaBelle has also been acting in films, television and on Broadway including her Oscar nominated role in A Soldier’s Story, her guest-starring role in televisions American Horror Story: Freak Show and her recent appearance in AFTER MIDNIGHT on Broadway.